Just call the Eagles’ defense and the offensive line the unsung heroes from Sunday’s 28-3 victory over the Jacksonville Jaguars. While quarterback Michael Vick will get all the credit, head coach Andy Reid understands that one man cannot win a ball game. At his post-game press conference, Reid stated that the defense set the tone for the entire game. Additionally, he was impressed with the offense (especially Vick) and the special teams as well. The only negative in Reid’s eyes were the large amount of penalties called on the Eagles. Still, Reid couldn’t be happier with the win and the heart his team displayed against the Jaguars. 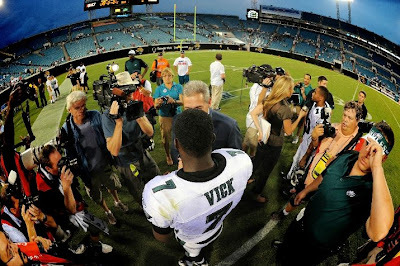 As for Vick, he is having his own personal renaissance. However, Vick realizes none of this would be possible without his offensive line and his go-to guy Jeremy Maclin. Nonetheless, Vick recognizes there is still room to improve. He knows that after he watches the game tape there will be plenty of areas that he work and improve upon for the upcoming game against Washington. Still it is amazing that a team once thought to be in “transition” is currently sitting in first place in the NFC East all by themselves. "I'm going to complement our defense, in particular our defensive line, they really sent the tone for the game. How they played was reckless and abandoned. I was proud of how they went about business today. The offense did a good job too. I thought Michael (Vick) had a good day because he can't obviously do that by himself. It starts up front with the guys around him. He ran for a touchdown and threw for a couple more too. He also look like did he a good job on third down - we had some third and longs and he was able to convert those plays. Special teams, we did some good things on the coverage teams. I thought we were flying around reckless and aggressive. We just got to cut back on penalties -too many penalties and we got to a better job there. All in all, I was proud of the guys for the effort and the intensity they had because this is a tough place to play. We haven't had a lot of luck here, but they didn't really care and came down here and play their hearts out. My hat goes off to Jack Del Rio and his football team because they are banged up a little and they played their hearts out today too." "Well, we put Darryl Tapp up for this game and what they allowed us to do was have a guy up there that can stop the run and the pass. We had to get a better rotation down with that for this particular team. I thought he played well with what I saw, but again I will have to look at the tape on it. With him being able to play, it freed us up to put him in to play those situations at that defensive end spot and that was the plan with the heat." "He's been playing his heart out for the last six quarters, including this game here. He played his heart out today so it's more about him than me than anything else. It's a tribute to what he has done and how he has handled things. I'm proud of him for doing that." "Before we get into that stuff, we went max protection. We had everyone staying in out to help the protection and he Vick kind of bounced around in there. It was a double move we ran and both sides ran the same route so he knew he had to get it in the end zone or throw it away – that's the way it was designed there." "It was great to go out there and get a win. I have to give a lot of credit to the offensive line. They did a great job in protection. The defense gave us plenty of opportunities. The receivers caught the ball and the running backs did a great job. It was a great overall team effort. I could have made it easier on a couple of plays, but that's just part of growing up and learning the scheme." "That was a good football team defensively, I know. And watching them on film, the one thing we did know is that they play good football at home. We just had to come out and start fast, and make the plays we know we can make and put points on the board. They actually did a good job of preventing us from doing that early." "The offensive line did a great job and there's a couple of things I could have done better. That just goes with film study, when the defense is blitzing, and I could have made it a little easier with a couple of players. But that's just part of me growing up and learning the scheme." "If you go back to my days in Atlanta I thought we always did a good job in the red zone and had a high efficiency and percentage in the red zone and were able to score a lot of points. My eyes light up when we get down there and I think everybody else on this football team does too. You have to go out there and put the ball in the end zone. You work so hard to get down there and you don't want field goals, you want touchdowns." "Jeremy knows how to get open and he has a great feel for the game. He's very intelligent and does a great job in man-to-man coverage and that's what you saw a lot of today and we were able to exploit it." "I knew I only had 12 seconds and I couldn't take a sack. It was me improvising to make the play and keep my eyes down field. I knew the clock was ticking and I knew I had to get the ball out and fortunately Jeremy was able to uncover. I knew we had enough time and Jeremy did a great job getting separation from Mathis and he was able to make a good play."